Celebrate the culture, history and future direction of Bay Area Gospel Music with inspiring and dynamic performances from Artists and Contributors from all across the country. The 1st Bay Area Gospel Music Weekend is an inaugural event that will, over the course of 3 days, bridge the gaps to build better communities through creative expression. With an Opening Night Concert, "The Good News" tells a story of Gospel music through the Bay Area artists and will serve as a tribute to the icons, leaders and pioneers who have contributed to the industry of Gospel Music. ...bridging the gap to build better communities through creative expression. 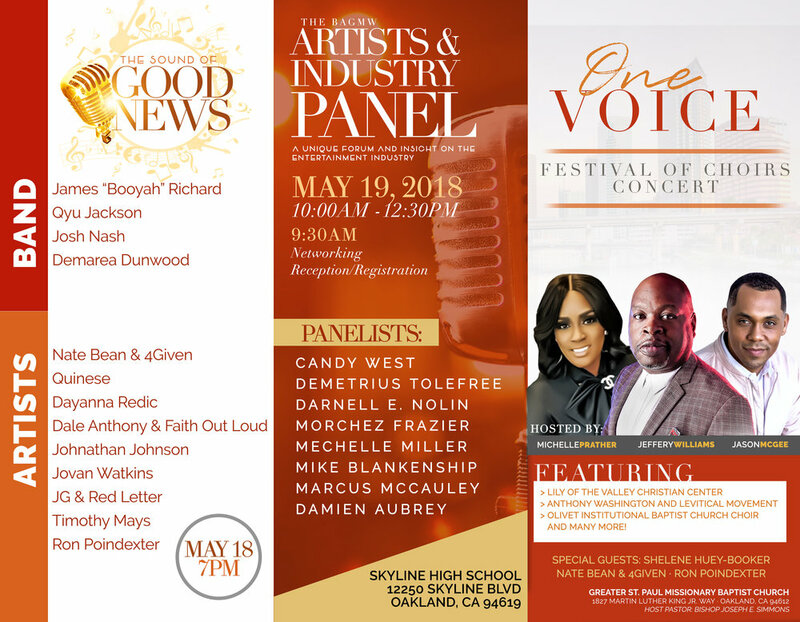 The rest of the weekend will feature panel discussions, one-on-one consultations, vision casting and another first for the Bay Area, a choir fest featuring choirs from Northern and Southern California and honoring directors, and leaders who have impacted Bay Area Gospel Music. FOLLOW THE BAY AREA GOSPEL MUSIC WEEKEND ON INSTAGRAM FOR UPDATES. For more information, contact thebagmw@gmail.com.